The Echo Spot from Amazon is a voice-controlled smart device that integrates the capabilities of Amazon's Echo Dot smart speaker but adds a screen and a video camera for watching videos, viewing photos, for teleconferencing family & friends and receiving updates or other output from Amazon Alexa virtual personal assistant. It is the prettiest Amazon echo device with a revolutionary circular LCD screen, reminiscent of an iconic National Panasonic clock radio of the 70s. Echo Spot relies on Alexa to interpret your voice commands and respond to them. Because Alexa's is a cloud-based voice recognition service, Echo Spot needs to be Internet connected via your home's WiFi router for Alexa to function. Like all other Amazon Echo devices, it can run customised skills that are continually adding to its capabilities and machine 'knowledge'. Qantas, weather and most city public transport active content is available through Alexa. 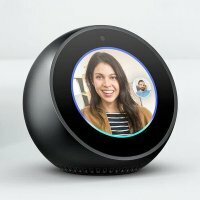 Echo Spot connects to Alexa, a cloud-based voice service, to play music, make calls, ask questions, check traffic and weather, set timers and alarms, and more. Just ask. Just ask for a song, artist or genre from Spotify, TuneIn, iHeartRadio, Amazon Music Unlimited, and more. With multi-room music, you can play music on other Echo devices in different rooms. Call or message anyone hands-free who also has an Echo device or make video calls to other Echo Spots. 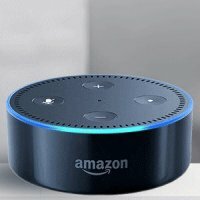 Quickly connect to other Echo devices in your home using just your voice. With four microphones, beam-forming technology and noise cancellation, Echo Spot hears you from any direction - even while music is playing. Alexa is always getting smarter and adding new features and skills. Just ask Alexa to control compatible smart devices, request an Uber, find a recipe, and more. Controls lights, fans, thermostats, garage doors, sprinklers, switches, and many other external systems with compatible connected devices from WeMo, Philips Hue, Samsung SmartThings, Nest and others. Link to C-Bus networks is achieved by using the SmartVoice service which Nous House can set up for you. Please contact [email protected] for further details.